The other day, the mint finally popped up in my garden. I couldn't wait to cook something with it. And then I saw the perfect organic eggplant in the store and I knew just what to do. Many, many years ago I saw a recipe in Gourmet magazine (RIP) and ripped it out. I've made it a few times, and it's so yum. So I'm creating a version of it for you and adding my own twist to it (a little less fuss, a little less sugar, and so forth). It's perfect for a party because you can make it in advance, and the flavor is so delicious everyone will ask you about it. You can cut it into bits and make a nice little appetizer with it, or you can just serve it as a cold side dish -- kind of like a pickle, only much better. It would be divine on an antipasto platter. But it's also just good on its own. I think I ate the whole thing myself, actually. 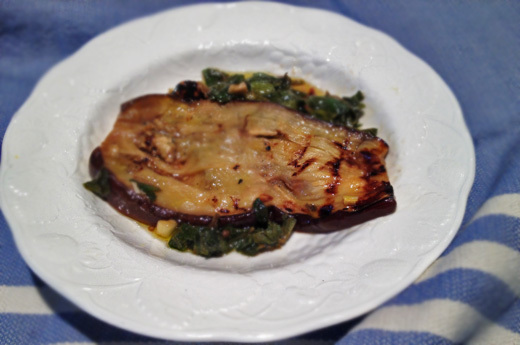 Slice the eggplant, salt it, and let it sit for a half hour, then rinse and dry. Grill it, but for LORD'S SAKE, don't forget to oil either the eggplant or the grill, or it might stick the way it did for me. (Above photo is of the only good-looking piece). If you don't want to grill it, you can sauté it on the stove. Mix the vinegar, olive oil, clove of garlic, and chopped mint. You can do one of three things at this point: Marinate it in the fridge for a day. Marinate it in the fridge for a few hours. Or -- what I did -- eat it immediately because you can't wait. It's all good!